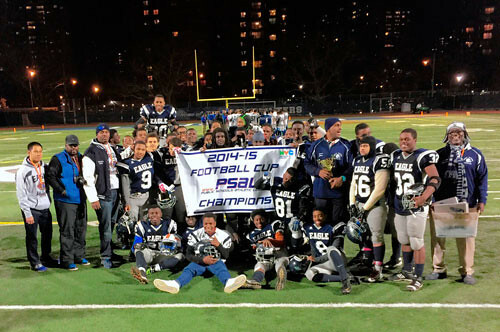 One of six Eagle Academy schools, Eagle Academy for Young Men II, like its fellow schools, seeks to provide an academically strong, emotionally supportive environment for young men of color. About 60 percent of Eagle II teachers are men, many of them black. Classes tend to be teacher-led and fairly traditional in style, but the curriculum is tailored to the students, with a focus on reading books by black authors and often using the works to discuss problems students see in their own community. Teachers also make use of popular culture, with one class, for example, looking at Magneto's advocacy for mutant rights in the X-Men movies. Because many students come from elementary schools where they were encouraged to be silent, Eagle II encourages class discussion using the Socratic method. The school is divided into six houses, each named for a prominent man of color. Every day students eat breakfast with members of their house, who they stay with throughout their years in the school. A majority of students say the young men treat one another with respect and fights are rare. “The boys are really brothers," says principal Rashad Meade. "We don’t have the same level of animosity” as many other schools. While Eagle II enforces discipline and students wear a uniform, the school does not suspend students. “We are a school that understands the needs of young men, and we’re structured to support them,” Meade says. The 6 to 12 school does not screen students for academics, and many 6th-graders come in below grade level, particularly in reading. For this reason, there is a strong focus on literacy. Middle school students have double periods of English, and their English teachers each have about 70 students, well below average for New York high schools. Test scores, though, remain below the city average, especially in reading. While teachers spend some time in the spring preparing students for standardized tests, Meade says, test preparation “is not what we do. We focus on overall literacy and not the test.” He notes that many Eagle II 8th-graders who score below grade level on the state standardized test pass the English Regents, which usually is given in high school. Eighth-graders also take the algebra, U.S. history and living environment Regents, giving them a head start on high school. Eagle II's graduation rate is high, and about three quarters of graduates go on to college. The college-readiness rate, however, is well below average, and Meade says many graduates struggle in college. The school is focusing on providing more demanding work to better prepare graduates “for the quality and quantity of work they will have to do in college,” according to its yearly education plan. The school offers a number of college-credit Advanced Placement classes. Several Eagle II graduates are now working as paraprofessionals at the school and hope to go on to become teachers. Meade himself grew up in the projects in Queens and went on to teach at the first Eagle Academy in the Bronx, and he frequently shares his own experiences with students. Eagle II offers internship programs, along with career and technical education (CTE) programs in barbering and in culinary arts. Some students divide their day between Eagle II and the half-day vocation programs at Co-op Tech. Eagle has a large sports program, including lacrosse, which is particularly popular. Middle school students must remain at Eagle II until 4:30 p.m. The longer day is optional for high school students, but most of them take advantage of it. Many also attend the school’s Saturday program. Located on a residential street sandwiched between busy Fulton Street and Atlantic Avenue, Eagle II shares its rather drab facility with two middle schools: Mott Hall IV and Ocean Hill Collegiate Uncommon Charter School. SPECIAL EDUCATION: Eagle II offers both self-contained special-education classes and team-teaching classes with a combination of special education and general education students. Meade says the goal is to get as many students as possible out of the self-contained rooms and into team teaching. Special education students participate in the house program. The graduation rates for special education students is high.